For those who first dip their toes in the commodities markets, it is always easier to go long or buy than to initiate a position from the short side, betting that the price of a raw material will decline. For some reason, human nature makes buying first a more natural and comfortable motivation. However, one doubles the number of trading opportunities in the markets with a willingness to bet that prices also go lower. The commodity market is an excellent vehicle for traders that use highly leveraged futures contracts to make profits from just a relatively small move in price. Markets move higher, and they move lower. The beauty of futures markets is that there are profitable opportunities when markets appreciate and when they depreciate. In fact, it is just as easy to bet that a commodity will drop in price as it is betting it will go up in price. When calling a broker to place an order to short a market, just them you want to sell (insert commodity, contract month, price, and all other specifications of the order) as an opening position. A short position will make money as the price of the commodity declines. To close a short position, instruct the broker to buy that same contract, closing and you’re out. When trading futures online, hit the sell button to open a short position. When ready to exit the position, hit the buy button. Selling a commodity that you don’t own may seem strange at first, but it will become second nature over time. Professional commodity traders typically do not have a bias toward buying or selling. They will sell if they feel a market will move lower and buy if they feel it will move higher. The procedures to buy and sell are both easy, so looking for opportunities in both directions doubles your chances of success. Since commodities are highly volatile assets, professional trades often initiate trades or positions from the short side. In fact, because human nature drives most people to buy or go long, markets tend to take the stairs up and the elevator down. Many markets tend to appreciate in price slowly and methodically, but they tend to go down quickly and furiously. Going short in the futures market is as risky as going long. With either position, you can make or lose on a dollar-for-dollar basis when the market moves in your direction or against you. The holder of a short position will make money when the price goes down and lose when it goes up. To limit risk, many market professionals will use limited risk instruments or put options to short markets. 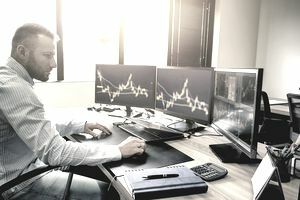 The purchase of a put option gives the owner the right, but not the obligation to sell a specified amount of a commodity at a specified price (the strike price) for a specified period (until the expiration date). The buyer of a put option pays the seller a premium for the right to sell. Put options are less risky than outright short positions in futures markets for important reasons. There is no margin on a long put option as the buyer pays the premium at the beginning of the trade. Additionally, the buyer of the put option can never lose more than the premium paid for the option, which is why there is no margin requirement on any long option. There are times when it is appropriate to be long or initiate positions with a buy, and there are times to be short and sell first. Commodities are volatile assets; they go up and down a lot. When a trader or investor limits their activity to only buying, they can miss out on many profitable opportunities.